Brussels Sprouts notoriously have a bad wrap. Usually those claiming to despise them have never tried them or worse were scarred for life the first time they tried a mushy slimy sprout or cabbage. Brussels sprouts are small little cabbage like sprouts that grow on a stalk. Brussels sprouts are part of the cruciferous family that includes: broccoli, kale, cabbage, mustard, turnips, rutabagas,and wasabi and horseradish. They were believed to have originated in Belgium near Brussels (hence the name) but there is some uncertainty to the claim. Based on historical records we do know that they were first introduced to France and England during World War I where they continue to be a popular food. French settlers who settled in Louisiana in the 1800’s brought them to America. Today brussels sprouts are mainly produced in California and Europe. They are a hardy plant tolerant of poor soil. When eaten regularly they may help prevent certain cancers and improve circulation. Never ever buy frozen brussel sprouts or asparagus for that matter. Always buy fresh. Sprouts still attached to the stalk are preferable. Avoid sprouts that are discolored (yellow or brown leaves) or loose. Choose instead the smaller sprouts that are green. Brussels sprouts have a very short shelf life. Try to use within a few days of purchase. The best way to prepare sprouts is roasted with a little oil. First wash then trim the bottom root part off. Not too much that too many leaves fall off. Next slice in half. Toss with a little oil, season with salt and pepper. Some recipes like this one suggest steaming them first. I am not a fan of steamed because they tend to loose flavor and can quickly turn too soft and rubbery. If you skip the steaming part it will take about 10 to 15 minutes to brown. 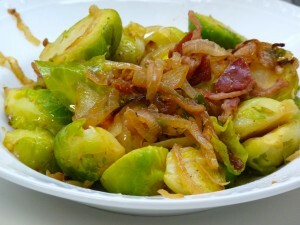 Ideally I this is your first experience with brussel sprouts cook the onions and pancetta as called for then toss in the sprouts turning to coat. Transfer to an oven safe pan and cook in a 375 degree oven for about 20 minutes. They should be tender enough to pierce with a fork but not mushy. Bring 1-inch of lightly salted water to a boil in a large, deep skillet. Add sprouts and simmer, covered, until crisp-tender, 6 to 8 minutes. Drain and run under cold water to cool. Wipe out the skillet. Add pancetta and cook over medium heat, stirring occasionally, until crisp, 5 to 7 minutes. With a slotted spoon, transfer to paper towel–lined plate. Add onion to drippings in skillet and cook, stirring occasionally, until tender and golden, 8 to 10 minutes. Increase heat to medium-high. Add sprouts, salt and pepper, and cook, tossing, until heated through, about 3 minutes. Add pancetta and vinegar, if using, and toss to combine. Use leftovers in an omelet the next morning. Yum, yum pancakes. Oatmeal banana pancakes. I so love pancakes. I think my son could eat them for breakfast, lunch and dinner. He is a picky eater. Occasionally he will surprise me like the time he ate hummus with carrots. He did not start out picky. In fact, when he started solids the more gourmet the better. Pancakes is one area I have made gradual changes. I swapped out the all-purpose flour for oat flour, added wheat germ and ground flax seed and omitted the sugar. I feel better knowing he is getting some nutrition. He ate these banana pancakes without a single peep. 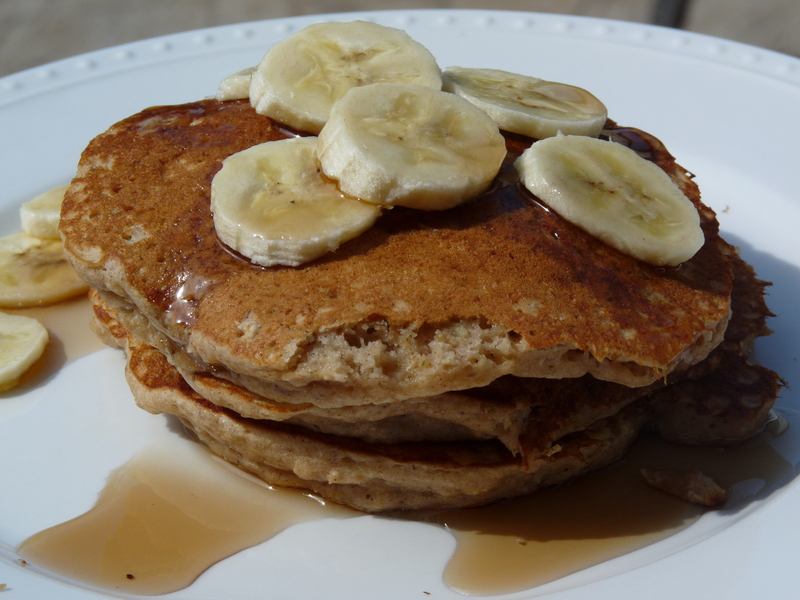 Be sure to visit Simple Bites to read the post for Banana Oatmeal Pancakes. You will find a few more suggestions to placate a picky eater. The addition of ground oatmeal flour gives the cakes a nice hearty texture. Be sure to puree the banana it helps it blend in nicely with the other liquids. I was worried about the strong flavor of the honey but you cannot even taste it. Preheat a large skillet over low heat. Add the oats to a food processor and process until very fine. In a large bowl, whisk together the whole wheat flour, ground oats, flax seed, baking powder, baking soda, cinnamon, and salt. Set aside. In a separate medium-sized bowl, combine the milk, yogurt, cooled butter or canola oil, honey, banana, and eggs. Hand whisk until thoroughly combined, but do not beat. Make a well in the center of the flour mixture. Pour the liquids into the bowl and stir with a wooden spoon until well incorporated. Do not beat the mixture. Just stir until moist and combined. Turn the heat on the pan or griddle up to medium-low. Grease with cooking spray, oil, or butter according to your preference. Add the batter 1/4 cup per pancake to the pan. Cook until golden brown on the bottom before flipping. You can usually tell it is ready to flip because the top will start to bubble. Pancakes can be kept warm in a 150 degree oven on an oven-safe plate or cookie sheet while the remaining cook. Serve with sliced banana, your favorite jam, honey, or syrup. To freeze leftovers: Cool on a cookie cooling rack completely. Then, place pancakes in gallon-sized zip top bags. To reheat, warm in a toaster oven or microwave. – Swap oats for instant oatmeal and process as directed. Or use oat flour, no need to process. – Use sour cream in the place of yogurt. – Replace the wheat flour with all-purpose or gluten free mix . – Add chopped or broken pecans to the batter or sprinkle on each pancake after you pour the batter onto the hot griddle. – Swap the banana puree with pumpkin puree, sweet potatoes or applesauce. –Recipe for a simple version of Whole Wheat Banana Pancakes.